Australia has just celebrated 26 years without a recession and the Government as well as the Reserve Bank of Australia (RBA) are cheering the ongoing growth. In fact, the common consensus amongst these authorities is that growth is set to rebound from its current 1.9% year on year rate and wages are set to rise as well. There were some encouraging signs in the latest GDP release, most notably the increase in public fixed asset spending (infrastructure), however when we step and take a longer term view things aren’t so rosy. GDP growth over the last decade has averaged 2.5% per annum; this is the weakest ten year average since the 1990 recession. 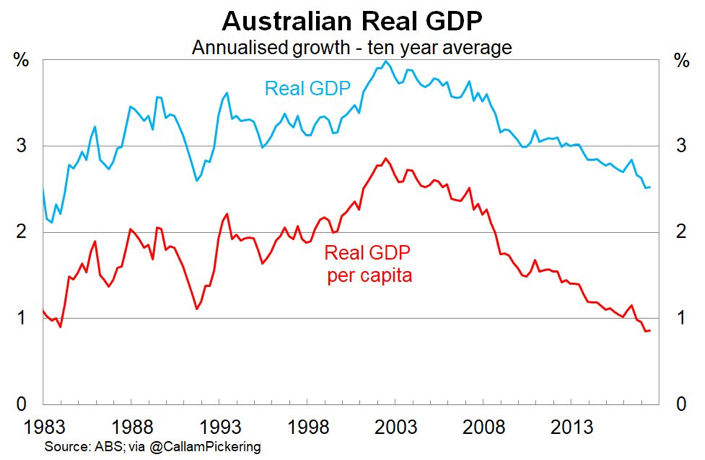 On a per capita basis the story gets worse, Real GDP per capita has averaged just 0.9% over the last 10 years, the weakest since Malcolm Fraser was Prime Minister. In other words, outside of an increased population through record immigration, the Australian economy is barely growing. As a result of this weak growth, wages have stalled and households are becoming vulnerable. It becomes increasingly clear to us that Australia has joined the rest of the developed world in “Secular Stagnation”. “Secular Stagnation” is a term originally used by Alvin Hansen back in 1938 and more recently popularised by noted economist Larry Summers. The theory is that four major factors are weighing on growth, inflation and hence interest rates. These factors are deleveraging, demographics, wealth transfer and technological advance. Whilst Australia is currently fighting the demographic trend through record immigration, it is the prospect of deleveraging that has most observers worried. Deleveraging is the consequence of high debt levels globally at the household, corporate and government level. Debt has risen steadily since the 1980s as interest rates have fallen. If we look back to the start of that period, it marked an important transition. The manufacturing base of the world started to shift from West to East and the rise of the Chinese economy started. 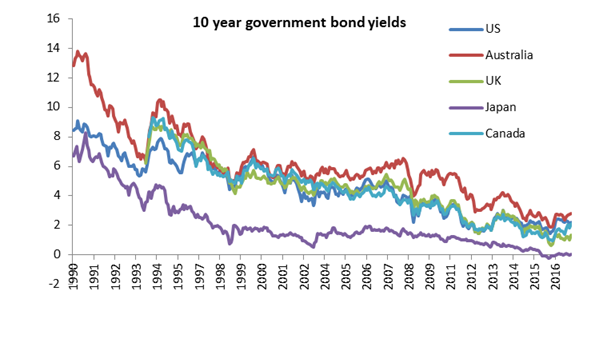 As a response to slowing economic growth Central Banks in the developed world began to cut interest rates. Over the period since, every time the global economy appeared to stall, interest rates were cut by 4-5% in order to stimulate growth and never fully recovered to their previous peak. The developed world shifted to a consumer driven services economy. By definition, the ability of consumers to purchase goods and services is equal to their income plus the net amount of debt they take on (or pay off). As interest rates decreased, households took on more debt and boosted the economy. The problem with this model is twofold, for increasing economic growth rates the amount of debt taken on in the next period has to be more than the previous period and secondly households (unlike governments) have a limit to how much they can borrow. Most of the developed world discovered that limit in 2008 whilst Australian households have continued to lever up, albeit it at a slower rate recently. The problem the RBA has now is the closer you get to zero, the less impact interest rate cuts are likely to have. In addition they have been quite vocal around the record levels of household debt, indicating they are unlikely to cut interest rates further. It is quite extraordinary that the Australian economy has managed to avoid a recession in the wake of the mining boom. One of the key drivers has been the residential property market and in particular the construction boom. This boom was spurred on by the RBA cutting interest rates from 4.75% to 1.5%. By cutting interest rates, they boosted property prices and that flowed through to construction. Whilst people tend to focus on those property prices in Melbourne and Sydney, for GDP and Employment it’s the volume of construction that matters. Leading indicators of residential construction started to point down late last year (particularly in Brisbane) and this driver of growth is likely to subside. Currently it appears the slowdown will be gradual but it is important to keep an eye on the key indicators to see if the decline does accelerate. Additionally whilst the national slowdown may be gradual, there will be pockets that experience a hard landing. This period for Australia is very similar to early 2000s in the US where the Federal Reserve cut interest rates from 6.5% to 1% in response to the mild recession caused by the Tech Wreck. This kick-started property prices and led to a residential construction boom which of course didn’t end so well. During that time, Australia had a significant advantage over the rest of the world with the dawn of the mining boom. This meant that when a shock came along the RBA and the Government had significantly more firepower than the rest of the world. Fast forward to today and the RBA has used up most of its bullets. On the other side, one of the benefits of the property boom has been a vast improvement in the fiscal condition of both the New South Wales and Victorian governments due to record Stamp Duty payments. 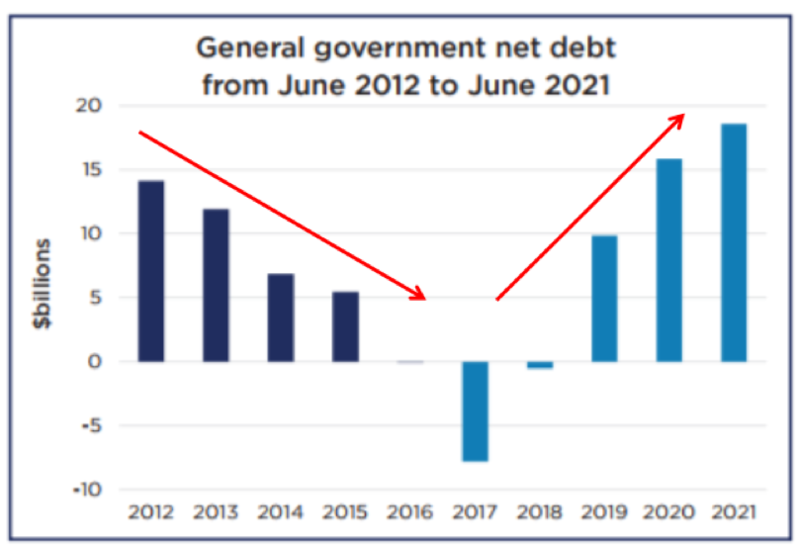 The chart below which looks at the debt balance of the NSW government and the rate which they plan to spend it over the coming years. With this improvement, these governments have started on an infrastructure spending spree. One side effect of low interest rates is that cheap money tends to lead to speculative investment and this in turn leads to booms and busts. As a result bubbles have become increasingly common around the world, whether it was the tech bubble in the late 1990s or the multiple property bubbles in 2007. Australia appears to be following that route with a series of rolling booms from resources to property to infrastructure, all without being able to find stable “trend” growth. So what this means for your Australian equity portfolio? Stocks exposed to the booms will see peaks and troughs; mining and mining stocks have seen it and are now through the worst. Residential property, consumer and finance stocks now look vulnerable despite recent record profits. On the other hand companies exposed to infrastructure construction are starting to see work in hand increase. Cimic’s share price has hit its highest level since 2010 and at the smaller end of town, a number of contractors are reporting record order books.